European stocks are recouping Monday’s losses as investors become more comfortable with holding risk. The turnaround is down to better PMIs in the Eurozone as well as strong US earnings, and growing expectations that the US Q2 GDP report will beat expectations after White House advisors have said that they expect a 5% annualised growth rate for last quarter when the data is released on Friday. These are powerful drivers for risk markets, and, for now at least, the prospect of higher interest rates in the US and a potential end to QE in Japan, is not phasing markets when the other headlines are this positive. We believe that the real winner could be European stocks. 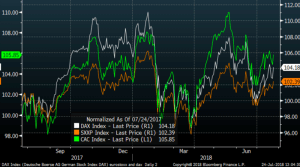 The European market has had a torrid year so far, only the Cac and the FTSE 100 are in positive territory for the year so far, which compares to a 5% gain for the S&P 500 and a 14% gain for the Nasdaq. 1, Growth: a strong US growth rate could ease Trump’s trade war rhetoric, which may benefit the export heavy European indices, especially the Dax. Added to this, stronger growth in the US could be catching, and the Eurozone’s economy could play catch up in the coming months. 2, Politics: Trump is scheduled to meet European Commission President Juncker next week, in an attempt to diffuse tensions regarding car tariffs. If a deal can be reached then we could see European car stocks, such as Germany’s Volkswagen and BMW, bounce back after a weak performance for most of this year. 3, Relative value: last, but definitely not least, the European indices are looking cheap in comparison to their US counterparts. The P/E ratio for the S&P 500 is 21.09 and 27.97 for the Nasdaq, compared to 15.89 for the Eurostoxx 600 and 14.16 for the Dax. Dividend yields are also looking more attractive in Europe, with the average yield on the Eurostoxx 600 at 3.53%, vs. 1.84% for the S&P 500. We believe that the Dax, in particular, is starting to look like an attractive prospect in the European market. The chart below shows the Eurostoxx 600 index (orange), the Cac (green) and the Dax (white). As you can see, the Cac is the best performer, followed by the Dax, and both indices are out-performing the overall Eurostoxx 600 index. However, the impact of an end to the deadlock around US/EU car tariffs at the Trump/ Juncker summit next week, and the fact that the Dax is cheaper than the Cac right now, could make the Dax the most attractive European option for investors in the coming weeks. The Dax is also looking attractive from a technical perspective; it is close to its 200-day sma, a major level of resistance, at 12,772. A break above this level may trigger further gains back to the mid-June highs of 13,185.